When homework tasks begin to mount up, it can be difficult to know where to begin. It is often tempting to complete smaller, more enjoyable tasks first, whilst the deadlines of longer, more difficult tasks creep ever nearer. Taking just a few moments to assess your work load and create a prioritised schedule will reduce the stress associated with studying overkill and help you to get your homework under control. Below is outlined a method which many students have found very useful. It may not be right for you, but it is certainly worth giving it a go. Start at the very beginning by taking a look through your homework diary. It might seem like a waste of time to write out all your tasks again, but find a new page on which to briefly list all your outstanding homework tasks and assignments. 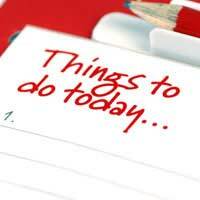 Take a look at your list and highlight any big projects that need to be completed. Try to break these up into smaller chunks. For example, you could divide a projects into research, writing the first draft, writing the second and proofreading. Write the date by which each task needs to be completed next to the task itself and make up earlier deadlines dates for smaller parts of larger projects. Next, allocate each task a number depending on how soon its deadline falls. Write a number one by the task which is due in soonest and continue in this manner until all the tasks have been numbered. This is generally the order in which you should complete all your tasks. Next to each of your numbered tasks, write down how long you estimate the task will take you to complete. Be careful not to underestimate. Go through your homework diary and make an extra note of each homework task on the date which you plan to complete it, following the number order. Knowing roughly how long each task should take you will allow you to plan yourself a sympathetic schedule. You should be able to estimate how much time you have available on each day and create homework sessions of an appropriate length. No more late nights, desperately attempting to complete a lengthy list of assignments in one go. It will also allow you to plan each of your homework sessions so that it includes fun tasks that you will look forward to, alongside any trickier, less enjoyable ones. In this way, each homework session should be balanced and manageable. Prioritising your homework tasks in this manner can lead to a more relaxed homework schedule and tame any chaotic studying habits you might have. However, it is not ideal for all learners. Some may find it too prescriptive, with little room for flexibility. The key is to find the right method for you. Regardless of which method you use, you do need to think about prioritising your tasks in some way. This will help to keep your mind clear and focused, allowing you to give more thought to each homework task.